For centuries, textiles have played a central role in the history and cultural life of people from regions throughout Africa. Africa Interweave: Textile Diasporas at the Currier Museum of Art in Manchester, N.H. through January 12, 2014, will explore the breadth of this dynamic art form through both traditional works and contemporary innovations. Cloth has long been used across the African continent to signify cultural identity, political power, religious belief and economic status. The works in Africa Interweave will highlight local customs and explore how regional and global cultural exchange and commercial interests from abroad have affected production, aesthetic choices and uses of textiles among people in different parts of Africa. Africa Interweave includes more than 40 textiles made in the last 100 years, including stunning full-length ceremonial costumes, designer garments and symbolic flags. Drawn primarily from the Samuel P. Harn Museum of Art collection at the University of Florida, Gainesville, and organized by Dr. Susan Cooksey, the Harn’s Curator of African Art, these works are among the most striking examples of this art form. 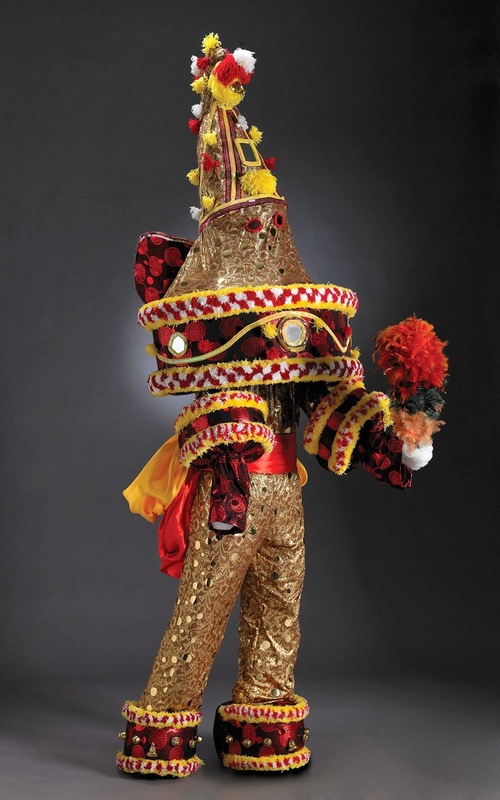 Tailored garments, including full-sized masquerade costumes, are shown alongside garments typically worn wrapped around the body. These large-scale textiles are displayed stretched from floor to ceiling to reveal their expert construction and detailed symbolic embellishments. One woman’s skirt made from natural raffia palm fibers by the Kuba people of the Democratic Republic of Congo, measures almost 20 feet long. Many innovative textile artists represented in the show provide a contemporary update to longstanding techniques such as resist-dyeing, embroidery and hand-weaving. A festive ceremonial cloth from the workshop of master Ghanaian weaver Samuel Cophie combines strip-woven kente with large appliqued adinkra symbols, which are traditionally stamped onto a cloth typically reserved for funerals. A resist-dyed scarf in the show by Malian-French textile artist Aboubakar Fofana reveals this artist’s role in revitalizing the use of natural indigo and environmentally conscious dyeing practices in place of synthetic dyes introduced to Africa in the 1800s. Textiles have also influenced contemporary artists working in other media. Achamyeleh Debela’s digital print The Priest (1990-91), which features a dizzying swirl of color around a man’s head, was inspired by the artist’s childhood memory of ceremonial processionals in which Ethiopian Christian Orthodox priests donned vibrant costumes. Africa Interweave reveals how artisans from across the African continent have adjusted their techniques and designs in response to a variety of internal and external forces. President Barack Obama’s visit to Ghana in summer 2009 is celebrated in a commemorative cloth that a local manufacturer produced as an expression of solidarity between the two countries. Likewise manufacturers from abroad have produced cloth to accommodate African markets. On view is a commercially printed cloth made in Europe in 1939 that commemorates an earthquake that had taken place in Accra, Ghana, and was later sold in Accra’s markets. Another fabric type, kanga, from Ethiopia, is a distinctly East African textile that has elements informed by printed handkerchiefs from Portugal, England, the Netherlands and Switzerland. It is an example of how styles introduced from regions around the globe from India to Europe were adapted by local craftspersons, and highlights the dynamic history of African textiles. 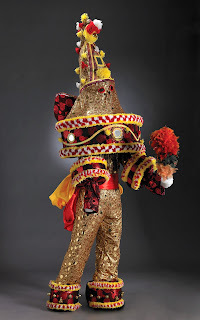 Africa Interweave features a lavish masquerade costume from the Calabari Ekpe society in present-day Nigeria, which has a 500-year history of successful international trade. During public initiations and other ceremonies, the imported cloth used to make this elaborate costume would reveal the wealth and status of the wearer. Damask from Europe was once the cloth of choice for such garments, but when this outfit was made in 2010, cloth manufactured with metallic dots was in fashion. This exhibition is organized by the Harn Museum of Art and made possible by Michael and Donna Singer, the Harn 20th Anniversary Fund, the 1923 Fund, the Center for African Studies, the Dr. Madelyn M. Lockhart Endowment for Focus Exhibitions at the Harn Museum of Art, and Mary Ann and Richard Green, with additional support from the Harn Program Endowment. The Currier’s presentation of Africa Interweave: Textile Diasporas is supported by: M. Christine Dwyer and Michael Huxtable, the Botnick Family Foundation/E&R Laundry and Dry Cleaners and the Coby Foundation, Ltd.
Africa Interweave: Textile Diasporas is a full-color, 160-page catalogue published by the Samuel P. Harn Museum of Art, Gainesville, Fla. (2011). The book is available from the Currier Museum of Art Museum Shop ($29.95 softcover). Saturday, November 9, 10 a.m. –2 p.m. Explore the special exhibition Africa Interweave; Textile Diasporas with the whole family. There will be art activities, a story time, gallery guides and more. Check currier.org for a complete schedule and details. Art Making: 10 a.m. – 1 p.m.
Saturday, November 16, 1–3 p.m.
Come sew a small, messenger-style shoulder bag made from authentic, hand-loomed African textiles. You can choose from an assortment of mud cloth and kente fabric pre-cut kits. While some sewing experience will be helpful, beginners are also welcome. The class offers expert instruction and assistance from seamstresses in the Sewing Confidence program, which fosters social and economic integration of resettled refugee women. All students will be welcome to take a tour of special exhibition Africa Interweave: Textile Diasporas at the Currier at 11 a.m.
Space is limited, and registration is required by November 1. $45 Members, $60 Non-members. Price includes all supplies and museum admission for the entire day. The Currier Museum of Art is located at 150 Ash Street, Manchester, NH. Open every day except Tuesday. The Currier is an active participant in the Blue Star Museum Program, providing active duty military, veterans and their immediate families with free general admission throughout the year. More information: www.currier.org or call 603.669.6144, x108.